Bluebird – Another Addition to ML and Calvin’s Mock Caldecott List | What is ML Reading? 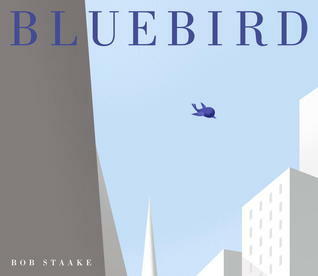 I’ve been going back and forth on adding Bluebird by Bob Staake to their Mock Caldecott list. I don’t want to overwhelm them with choices. And quite honestly, it wasn’t one I wanted on my long list until I looked at again yesterday. Today, I saw a bluebird as I entered my car to drive to work. It’s only January. Next, I looked on the ground and saw a robin. As my grandma always said, “The robin’s are here, spring is on it’s way.” Call it a sign if you like. It was a reminder ML and I are allowed different opinions. And I should provide a variety of art mediums in the Mock Caldecott. To quote inside the book, “The illustrations in this book were rendered in Adobe Photoshop.” Most of the books on the list I created for Calvin and ML include watercolor. With a quick web search, I learned NC bluebirds do not migrate. In February, they begin to select their nesting territory. Last year we had two broods of bluebirds in our birdhouse. This weekend, while ML and Calvin are reading Bluebird, I’ll spring clean their house in hopes they return. If ML and Calvin award the medal to this wordless book, the laugh’s on me. Actually it’s an almost wordless book; set in the city with a bluebird following a boy throughout his day. The words are on street signs, the classroom chalkboard, busesm trucks and a cart to purchase boats in a park. I don’t want to tell you more. I want you to find your own meaning in the book. However, here’s a link to his process www.bobstaake.com/bluebirdbook/1.shtml. I love the image of the proposal he sent to editors. Really helps show the long, arduous process of getting your book in print. Us lay people have no idea. Thrilled I saw the bluebird and rediscovered this book. Like so many other books, you discover more when you read it months later. Who knows? Maybe it will make it to the top of my list. This entry was posted in Picture Book and tagged Bluebird, Bob Staake by mlreads. Bookmark the permalink.